The Energy Don's Blog: Does your car achieve its official miles per gallon? Does your car achieve its official miles per gallon? 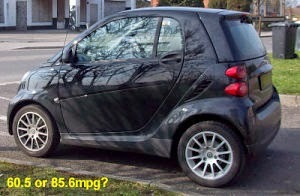 My car gets 60.47mpg1. How do I know? Because I have recorded every litre of fuel put into it since I bought it three summers and four winters ago, and trust that the odometer gives me a reasonably accurate mileage driven. So am I pleased – it does sound like a decent fuel economy, after all? Well, not wholly, as although it is almost twice the number of miles per gallon of its predecessor, it is still a lot lower than the 85.6mpg the manufacturer's website would have you believe that I should be getting. And if you've been sold a promise of fuel economy, to get a result that's almost 30% worse is more than a little disappointing. Of course, that also means I am pumping out 30% more CO2, the main gas contributing to climate change, than I expected. So does that mean I am a poor driver? Probably not; when I shared a car with another driver I consistently got better consumption than she did, largely through more gentle acceleration. I am always conscious of my consumption and try to avoid sharp braking, and hardly ever use the air-conditioning (which can be a huge draw on engine power, thereby reducing miles per gallon). What it really means – and this seems to be an effect that is particularly pronounced with smaller more economical cars, that the official figures are wrong. And how can this be? Well, the official test figures are undertaken using something called the New European Driving Cycle (NEDC) test. This places the test car on a rolling road, and a highly trained driver then drives as gently as he or she possibly can, to achieve the reported figures. Moreover there are some tricks of the trade that be used to flatter the results. Tyres may be over inflated to reduce rolling resistance; the car may be run in a higher gear than would be normal for the speed; special lubricants (and never oil that's been in the engine for a year) can be used, and weight is minimised by removing the spare wheel. In extremis, the alternator may even be disconnected, the radio aerial removed or door handles and other protrusions taped over to reduce resistance. All are apparently permitted – and of course there are no traffic lights, roundabouts, head winds or traffic jams to reflect reality. Comparison of official and "real-world" fuel consumption and CO2 emission values for passenger cars in Europe and the United States, shows that the average discrepancy between them rose from less than 10% in 2001 to 25% in 2011. The EU has got wise to this. They realise that the tests, which are fundamentally unchanged since first introduced in 1970 no longer reflect reality and are too easily "gamed". Instead they would like to introduce a new World Light Vehicle Test Procedure (WLTP). However most manufacturers are opposing this, as they fear that they will be unable to meet EU-mandated fuel economy standards for new vehicles and incur huge fines. I have some sympathy for the manufacturers, but not for their attempt to delay the introduction of WLTP and more realistic estimates of miles per gallon and emissions. There have been great improvements in energy efficiency of private cars over the past couple of decades, as engines have been designed to burn more leanly, aerodynamics have been improved and weight has been reduced by the introduction of more plastics and composite materials. And if moving to a new calculation basis means that the EU's targets, set using the old method, are unachievable in the timescale, then maybe the targets should be adjusted to match any adjustment between the old NEDC and newer WLTP methods. But consumers should demand more accurate and realistic estimates of typical fuel consumption, rather than being given increasingly unrealistic ones. So the car manufacturers should get real and give us real estimates of fuel consumption and CO2 emissions. And who knows, in a future blog, I may even be able to claim that I have bettered the official consumption by 10%! 1 The UK average figure, based on retail fuel sales into the domestic market of 27.4mn tonnes of retail motor fuel (approx. 7.02 billion gallons) and DfT estimates of 242.3 billion miles driven in 2013 works out at an unimpressive 34.5mpg. However this is about 4% better than the equivalent figure for 2008, showing that there has been some real improvement, bearing in mind that almost two thirds of the cars on the road today were also on the road five years earlier; it also includes some non-passenger vehicles when they refuel through retail outlets. 2 The ICCT report says that "the gap was especially pronounced after 2007–2008, when a number of European Union Member States switched to a CO2-based vehicle taxation system and a mandatory EU CO2 regulation for new cars was introduced."